This is the hilarious moment a seal is snapped rolling around on a beach after finding something really funny. 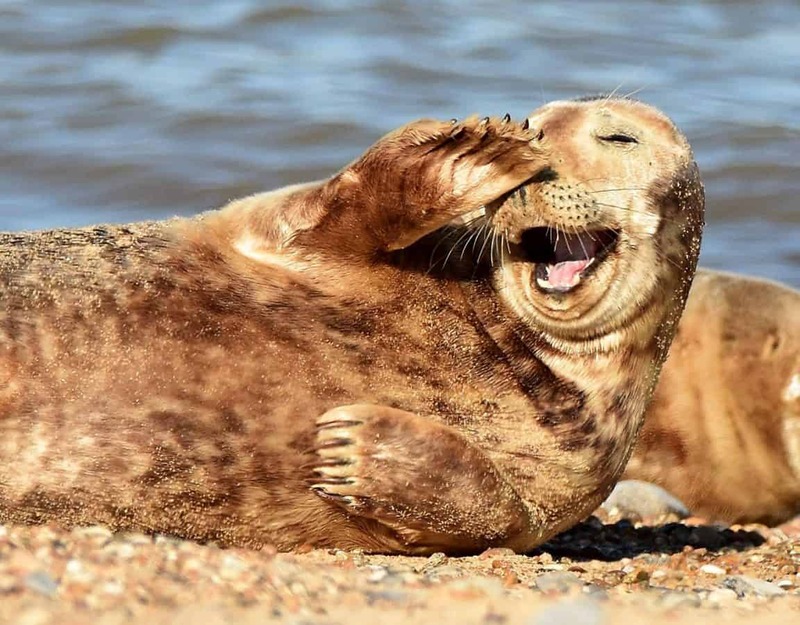 Photographer Sue Reynolds, 53, took the perfectly-timed image of the amused grey seal lifting his flipper to his face as he burst into laughter. He looks as if he’d been told a joke by one of the dozens of seals which surrounded him on the sand at Horsey Beach, Norfolk. Sue said: “I was there picturing the seals but this one caught my eye as his expression just suddenly changed. “He looks like someone’s told him something really funny as he cracked up on the spot. Sue, from Ipswich, Suffolk, often travels to the Norfolk coast to see the grey seals which breed in their thousands. But it was the first time she captured such a comical moment during a visit last week. Sue said: “They’re very popular up there and so cute. “They don’t seem to mind the crowds but I don’t get too close as I wouldn’t like to scare them – although this one looks far from scared! Grey seals spend most of their time out at sea feeding on fish. They come ashore to breed and give birth to fluffy, white pups during the winter months. The pups remain on the beach until they have moulted their white coasts and trebled their birth weight, at which point they head out to sea to hunt for themselves.